ESCFederal’s objective is to position the right team for your project, while providing the ultimate grounds keeping service. 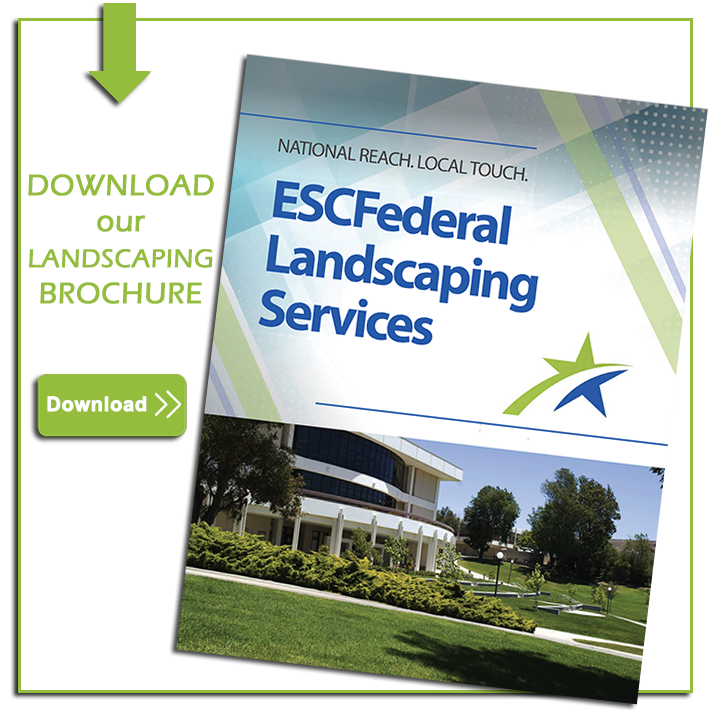 ESCFederal Offers Quality Landscaping Services Delivered with Uncompromising Service. ESCFederal Landscaping Services is your single-source solution for landscape and property maintenance services. We have the technology, skills, and experience to fit your needs and save you money. Whether you are looking for creative, custom landscaping, native landscape habitat, hardscape construction, seasonal snow removal, or annual grounds keeping and landscape maintenance, we will keep your facilities looking and operating at their best for years to come from the curb to your building entrances. Our landscape and property maintenance services are designed to generate workflow synergies that, together with management optimization, create value. We know quality is measured in the smallest of details for every stage of your outdoor environment. You’ll hear us say we have “national reach” and “local touch.” And it’s true. We have an extensive fleet of service vehicles operated by locally trained and experienced employees who take pride in their work and have regional managerial teams to keep things running smoothly and efficiently. Landscaping Maintenance Services. What’s Right for You? As a national, owner-operated, fully-integrated landscape and property maintenance services provider, our goal is to provide exceptional service delivery to the marketplace. Our leadership philosophy is 100% customer focused and supported by the best training in the industry for all our team members. Utilizing best practices with a defined standard operating procedure, our landscape technicians deliver consistent results. With over five decades of landscaping, building and facility services experience, we deliver top quality integrated facility services to property owners and managers across the United States. Get the buying power and resources you expect from a national service provider. At the same time, enjoy the personal hands-on attention of local management and employees. Read more about the landscaping services we offer.